Some of the biggest stuff was the easiest to get rid of. The 10 year old bed on which the springs were starting to go? Off to charity. The unwieldy computer desk that, while I made it work, really wasn’t that well designed? Ditto. The 90-lb tube television that I held on to mostly because I was too cheap to replace (and am still too cheap to replace, being TV-less even now)? Charity again. And so it went over a period of a couple of weeks, between the time I started packing and the actual departure on the road trip. Papers, knickknacks, assorted dishes, old clothes, books… so much of it bagged up and off to the Salvation Army or into the rubbish bin. The bigger the object was, such as furniture and appliances (or the dreaded “doo-dads” of spare electronics and such that I kept around because “you never know when I might need it/fix it/sell it”), the more likely it was to be tossed. I was on a tear, trying to save space in my storage unit, and eager to de-clutter my life. It continues, though though at a decidedly slower pace, since I’ve gotten back. Boxes of stuff I hadn’t seen from my childhood, slowly gone through and tossed away. You may even remember my post a few months back about my old Transformers toys; they ultimately went to one of my readers. His son is playing with them, and knowing that they’ve gotten a second use in another kid’s hands, even for a short amount of time, is pretty awesome. This afternoon, exhausted, frustrated, flummoxed, and ultimately feeling overwhelmed and depressed by the job search, I pried myself away from the computer and opened another box. It was a small box. Tiny. Half a cubic-foot, at best. What was inside was nothing but papers. Paper. My nemesis. My Achilles-heel. The one thing I always tend to be a pack rat about. Inside the box, neatly organized, were stacks of correspondence. Old cards. Postcards. Letters. Photographs. Some of them were from family, some from friends. Some were from friends who have disappeared from my life, eliciting more than a few “where are they now?” thoughts. Christmas letters from my Aunt and Uncle. Graduation announcements. Letters containing details of a family member who moved back east. A birth announcement from my cousin for his newborn son, who’s now 16, which made me feel very, very old. There were postcards from my parents’ travels. A letter from my Great Aunt donating money to my college fund. A get well card from my grandparents from when I broke my arm at around 10 years old. Letters from high school classmates that we exchanged before after we went to colleges in separate towns. Old birthday cards stretching across the decades were in the box, some from years when I was too young to remember anything. One of them was from the late 70’s, with a glowering Stormtrooper on the front (I was a geek at an early age). The inside was signed by someone named Wendi. Who she was or where she might be now, I have no idea. If this was your signature when you were five, say “hi”, won’t you? As I touched each item, I realized that I never made any conscious effort to keep them all. It just sort of happened. More often as not when I got something in the mail, I’d enjoy reading it and absorb whatever well-wishes were contained therein, then end up placing it in a small pile on the bookcase. As I moved around, I just moved the pile, never really taking the time to go through it. Certainly not doing so before leaving on my travels. It didn’t take up much room in the storage facility, after all. Now I have the time. I’m still just as clueless as to what to do. Some are easy to toss. Friends and acquaintances who’ve gone out of my life, that I have little expectation (or, in some cases, desire) to see again. Random Christmas cards from my old workplace. A Valentines-Day card from The Ex went directly to the recycle bin, possibly breaking the sound barrier in doing so. What about the hard stuff? What about the postcards from The Parentage, detailing the travels they’ve taken that, honestly, I have a hard time remembering. After all, we remember our own travels the best, don’t we? But it’s nice to be reminded of where they went, with the little messages on the back detailing what they did in those far-off places. 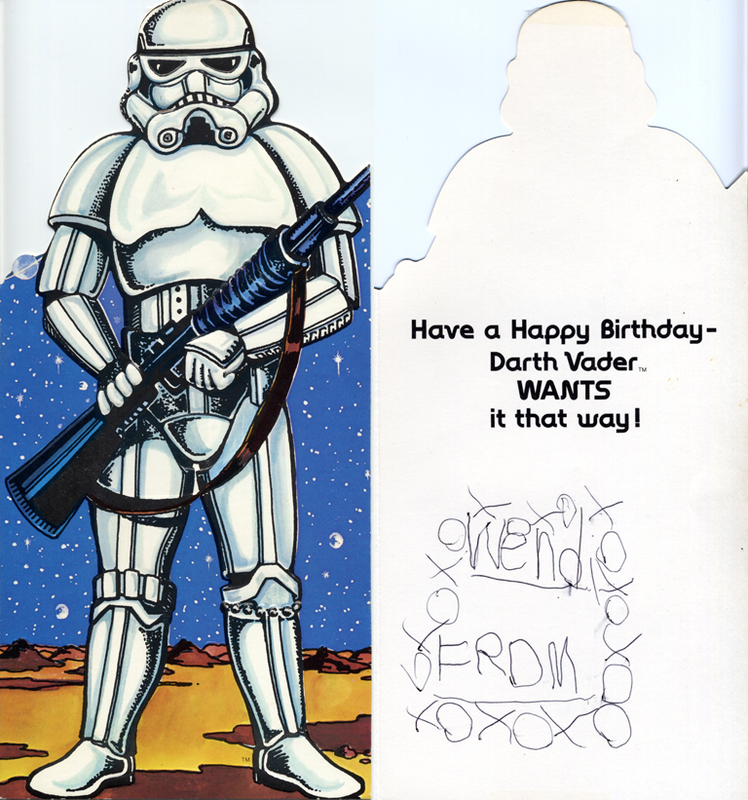 Or the birthday card from my best childhood friend, the one who raced around the backyard with me flying our X-Wings and Tie-Fighters on long, hot summer days? The one who I lost touch with when his military family was moved back east? Or worse, what about the old birthday cards from my Grandmother? The ones where she wishes me the best and writing how much she loves me? I have a whole series of those cards… enough that I can actually see her handwriting degrade as the years went by, which is both sad and endearing. Sad because of the ravages of age (the ones chasing us all) become evident over time. 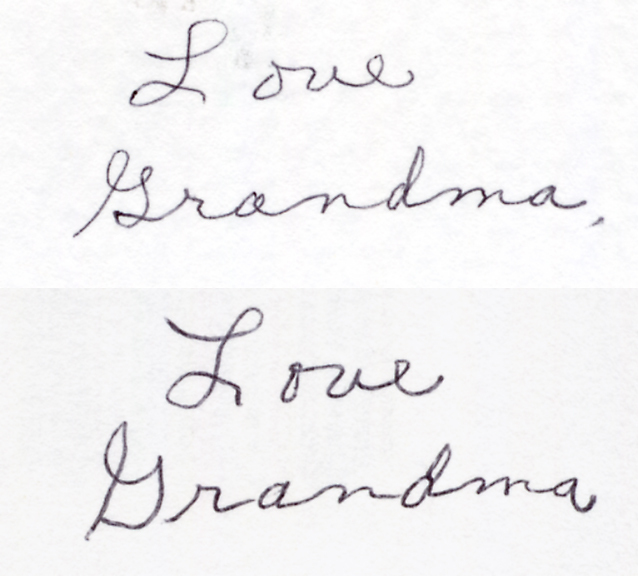 Endearing because it’s clear how much effort she made to send a birthday wish to her grandson, writing less cursive and more each character separately as time went by. It’s subtle, but you can see the difference in the lower image (or at least I can). Though, to her credit, it’s still way better than my own handwriting is now. On a purely practical level, there’s probably no reason to keep them. I rarely look at these things in fits of nostalgia. Heck, look at how long many of them sat on a bookshelf, gathering dust? On the purely emotional level though, it’s tough. Running my fingers over handwriting of someone that is gone now, and who will never write me a “happy birthday” message again? Even having not looked at the cards in years, it pulls. What about the birthday cards from The Parentage? It seems silly to keep an inch-thick stack of cards… but if I toss them now, will I regret it in 20 or 30 years? Practicality vs. nostalgia? Which should win? That’s pretty much the only thing I save — cards, letters and photos. I don’t know the answer to whether to continue keeping them although I have wondered, having moved so much lately. I’ll be interested to hear what you finally decide. I half-heartedly wondered if I should scan everything so it’s at least easier to store but that’s soooo time-consuming. You make a good point. If I had kids, it might significantly shift my point of view.. I felt like this before the kid, but still, I think it’s got to do with personality. Treasure to some, garbage to others. It is often the smallest things that contain the most memories. We don’t pick up a desk while hiking a trail but we may pick up a shiny rock or take a picture of a beautiful view. We don’t buy a mattress when we travel in a foreign land but we may pick up a trinket (or, in my case, a fridge magnet). It’s these small things that often bring back the strongest and most beloved memories. The cards, letters, and photos in your pile are placeholders. They are keyed to memories. Think how your mind wandered while you went through that pile. I bet you remembered things you haven’t thought about in years. As we age it gets harder to bring back some of those memories and having a small token to remind us, worth little when we are young, becomes precious as we get older. In other words, put the cards, letters, and photos back in the box and keep it in a safe place. Someday you will thank yourself for doing it. Maybe, but we are a result of the good and the bad. Maybe you can keep the bad at the bottom of the box … a very deep box. I loves me some good stuff-tossing, but like the other commenters, I keep photos & letters. I got rid of toys and most other “sentimental” things from my younger days, and I’m not sorry I did, but perhaps because I got rid of that stuff that I hang on to the photos and letters: maybe there’s a kind of memory-barter going on, in which by shedding this I feel all right about holding on to that. Besides, it’s only a box apiece. . . . I see the merit in your thoughts… still, there’s that overwhelming desire to get rid of STUFF!